Not a valid link anymore, anyone have this schem? Last edited by modman on 25 May 2015, 11:55, edited 1 time in total. 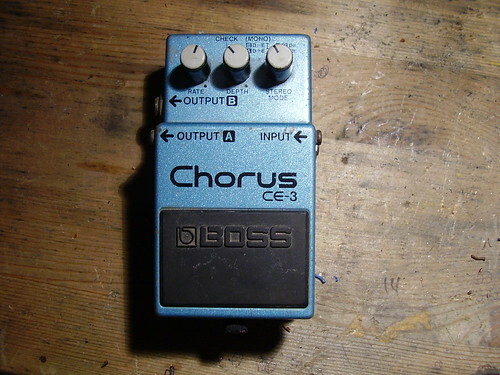 I speculate that the way huge blue hippo chorus is a modified CE-3. this is based on an interview I read with Jeorge Tripps (that I can't remember) that some semi famous artist brought his CE-3 to him and he modified it. short thereafter Way Huge came out with the blue hippo chorus pedal. Just speculating but hey who knows... maybe we could look into it. briefly looking at the blue hippo gut shot I would say its a close match. i have a CE-3, didn't think all that much of it. will take gutshots and upload. never taken gutshots before... any resolution i should be aiming for? maybe i can shoot the pic with my dad's eos ds1 mkIII i don't think we'll have any resolution hitches then! Stock it doesn't sound very interesting, so that's the reason to mod it. - Do the speed mod: either reduce C28 to .047 or reduce R52 to 470k (the latter is much easier to do, because the .1 cap is glued to the TL022 chip). Both will double the max speed of the modulation. 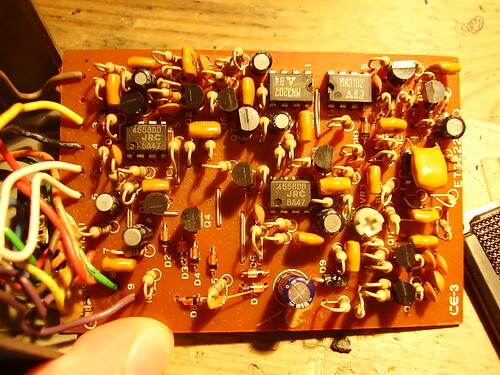 - alter the volume compensation R18 (when the effect is on, this resistor is parallelled to R19 in the feedback loop of the first opamp stage, thus reducing the gain of dry and wet signal.) Make this one bigger to get a slightly stronger effect signal, or just remove it completely. -Finally replace the electrolytic caps C3, C7 and C8 with quality film caps and the 4558 opamps with NE5532 or OPA2134 or or or ... for more hifi. At least this is what i have done to mine and it's a very tasty chorus now. the fact is i liked how it sounds, so i bought one cheap off ebay, it on its way right now. 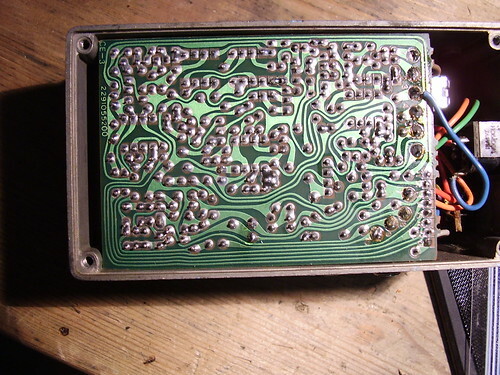 There are two good pics, both sides of the board, on http://bossarea.com/forum/ in their 'Internal Pictures of Boss & Other pedals' thread, page 2. When searching for information about the CE3 myself some time ago, I was a litttle disappointed about finding almost nothing here on FSB. This appears to be an "older" unit - uses the ACA (12v) adapter. You know us yanks can't handle metric! Finally a pedal I have, that I can share gut shots. Mine must be newer, I bought it in the late '90s for $50 at the hock shop. I have the same model (so if any more pics are needed I'm happy to do some too), but what's the deal with the 12V supply? can they be tweaked to take the 9V supply? rocklander wrote: I have the same model (so if any more pics are needed I'm happy to do some too), but what's the deal with the 12V supply? 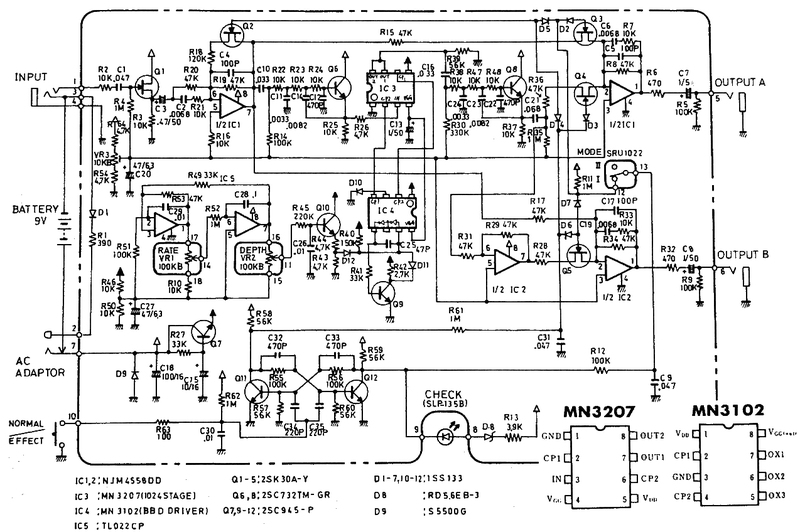 The early compact pedals was designed to run on either a 9V DC battery or 12V DC adapter. Because of this the ACA adapter was a 12V adapter. The voltage was reduced to 9V internally by using a 470 Ohm resistor and 1S2473 diode between the minus input on the power jack and ground. 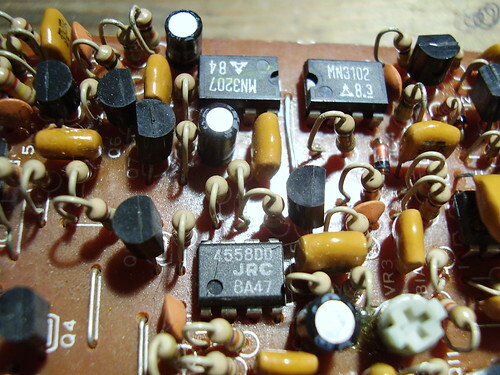 The resistor diode pair was later removed and at the same time the ACA adpater was redesigned to output 9V instead. locate the (-) connection on the board from the DC jack. the pad right besides it is GND (fro the battery), so just put a small jumper. whosyourdaddy wrote: Cheers, any progress here? Maybe someone would like to try using this technique. Corel or Inkscape would be the answer. I need to true-bypass one of those. Can anybody explain how do I remove the buffers? As that a crack on that 4558? No, not a crack, good eye though. I opened it up and it was just a hair or something stuck to the chip.